Today a new fork of the ccMiner software for Nvidia GPU mining was released with the addition of support for the CryptoNight algorithm used by coins such as Monero (XMR), the fork by tsiv is still an initial beta and is quite heavy and not optimized, but works. 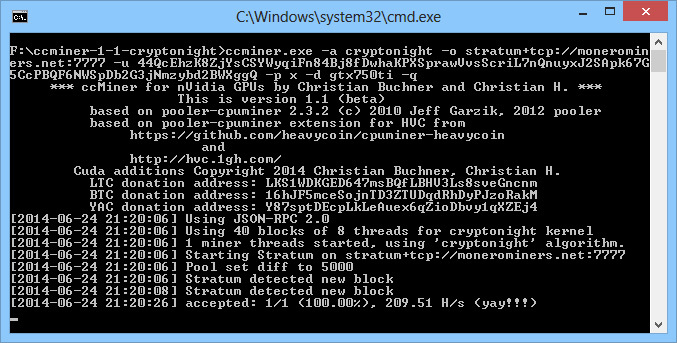 We have compiled and released a windows binary of the miner for anyone interested to try it out, our tests have shown that on a GeForce GTX 750 Ti video card we are getting about 205-210 H/s in terms of hashrate. If you run the miner on your main GPU your computer will most likely be very unresponsive after the miner starts, but this will not mean it is frozen. Do note that the windows binary you can download below is compiled for Compute 3.0,3.5 and 5.0 cards (32-bit version only) in a single binary, so it will not work on older cards. If you are unsure what version of Compute does your video card support check the included GPU Compute Capabilities List file. It is also compiled with Visual Studio 2012, so if you do not already have Visual C++ Redistributable for Visual Studio 2012 you will have to download and install it, otherwise you may be getting error for a missing DLL library. Adding the option -l 8x60 to the command line for running the miner might give you a few more extra hashes per second in terms of performance improvement, so you might wan to try it out. Is there a way to compile for compute 2.0?